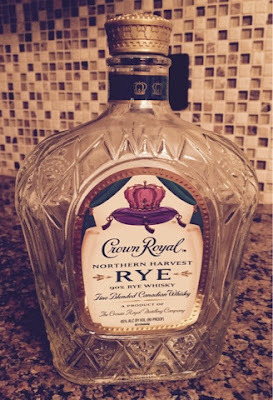 Count this among the dozens of other new reviews of Crown Royal's Northern Harvest Rye following Jim Murray's naming it the 2016 Whiskey of the Year. But, the flux of reviews makes sense. After all, for once he selected a whisky that is not only available, but also affordable. I never expected that he'd pick a whisky that has a screw top. Considering this rye is readily available at nearly every grocery store and liquor store, and for only about $27, it was an easy decision to grab a bottle the next time I was at the store. Who knows if I ever would have gotten around to trying this one if it weren't for Murray telling that I should. The nose is very good, giving off the traditional rye spices, but in a somewhat muted fashion. It's not nearly as in-your-face as some of the high proof American ryes, even despite being 90% rye. At 90 proof, there is no burn whatsoever with this (which is common among the Crown Royal line). Though it's definitely a rye, it is also definitely a Canadian whiskey. Perhaps I'm demonstrating a bit of a prejudice, here, but Canadian whiskeys, ryes in particular, always come across as a bit folksy. They're inoffensive and non-threatening. They're not bold and as far as their flavor goes, they play it safe. This one is really no different. Up front it provided familiar notes of cinnamon and cloves, underscored by a toasty, light wood flavor that carried throughout. It's sweetened just a bit by a very light maple syrup flavor. On the back end it has a cooling, menthol flavor, contrasting well with the cinnamon notes in a sort of icy hot flavor that I really enjoyed (but it didn't taste like the product Icy Hot, which I'd imagine is not all that enjoyable). Unfortunately, the whiskey comes across a bit watery, though, so the flavors do not linger very long. All in all, this is not my "Whiskey of the Year." I've had plenty of better whiskies this past year. However, as far as value goes, this one is tough to beat. It's a very good whisky that is affordable and readily available, and there's a lot to be said for that.